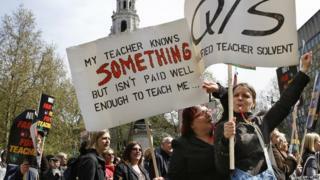 Schools in England are set to be hit with a new programme of strike action over pay, working conditions and school funds. National Union of Teachers members will walk out first on Tuesday 5 July, after 91% of those who voted backed the action. The turnout was 25%. The government said it was disappointed and was committed to formal talks. The action is the next step in the union's long-running dispute with the government and will affect in schools in England and Wales. Mr Courtney said: "The NUT is not taking action lightly. "The effects on children's education are also real and damaging. "As a result of school funding cuts, class sizes in primary and secondary schools are increasing, subject choices are being cut, and children are getting less individual attention as teachers and support staff are made redundant or not replaced when they leave." "There is worse to come, with the Institute of Fiscal Studies predicting that the biggest real terms cuts to per pupil funding in a generation are on the way. "There is already a teacher recruitment and retention crisis in our schools. "Without significant change to the pay and working condition of teachers, this will simply deepen. "We know that many parents share our concerns." The union is calling for an increase in funding to schools and education, and to resume negotiations on teacher contracts to allow workload to be addressed. Teaching unions have complained that schools have not been fully funded to meet extra costs of pay, pension and National Insurance costs passed on by the government. The Department for Education said: "It is disappointing the National Union of Teachers has chosen to take unnecessary and damaging strike action, which less than a quarter of its members voted for. "It is even more disappointing when we have offered and committed to formal talks between ministers and the unions to address their concerns about pay. "Industrial action causes disruption to children's education and parents who have to take time out of work to arrange childcare, we urge the NUT not to proceed with this strike and to resolve pay disputes at the negotiating table rather than playing politics with children's futures."